Nearly every whitetail deer hunter can give you a single answer to the question when asked which buck has been their most memorable. The majority will respond in resounding fashion that their very first buck was their most memorable. 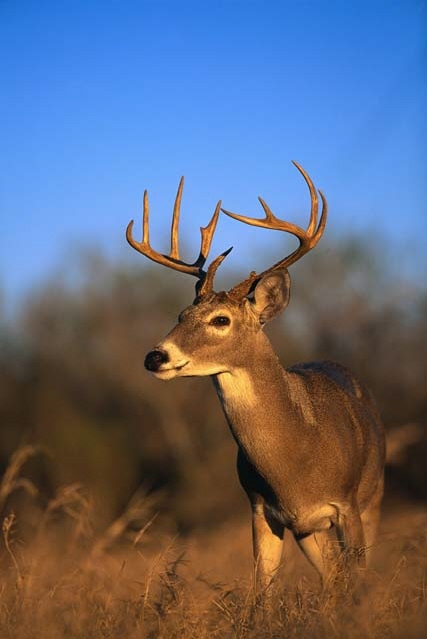 Although there have been plenty of monster racked whitetails and a bevy of does along the way that very first buck stands as clear as a Monday night football game on that high resolution television that you so proudly hooked-up all on your very own. Complete with surround sound the event begins to come to life. Sunrise had come slowly as everything in this big dark patch of woods had taken on a life of it’s own. Minutes earlier trees began to move and sway at the trunk and that patch of tall grass appeared to have a pair of tall strong cougar tails waving like a pair of cobras about to strike. The stench of an old bear getting closer hung thick in the air and I knew for certain that at any moment the silence would be broken with a horrendous growl and a fight for life. So much for the indestructible teen persona which was errantly left back in he city. Fortunately my active imagination once again proved wrong. The images I had created in my brain faded fast and brought the sight of lesser animals like chickadees, bluejays, a couple of squirrels, and a field mouse who had sought refuge at the base of my feet. A welcome sight I thought to myself and the hunt can now begin. My first hunt on my own for whitetail deer. Just 45 minutes earlier my dad had dropped me off and wished me luck before driving away to his own hunting spot a half mile down the road. And now as I sit here I am contemplating the importance of the hunt. We weren’t wealthy by any stretch of the imagination and the fresh venison would surely be a great help on the grocery bill. But the main aspect that played through my head was the motion of shooting the deer. I knew which way it would enter the fire lane that I watched and I knew it would be at least a 10 point buck. I also knew it would walk out, stop perfectly broadside, look in the opposite direction, and that’s when I would pull the trigger on my trusty 30-30 and claim victory. Shortly afterward would follow a big congratulations from dad which, looking back now, was probably as much a driving force to succeed as hunting was itself. As I snapped from my daydream I realized a deer was standing in the fire lane about 100 yards from where I sat. So much for my predictions. I never saw the deer enter the lane which was about 30 yards wide. It was one of those mysterious moments where the deer just appears like magic. I’m somewhat perplexed at the sight and the thought that the deer had nearly slipped past me in broad daylight across what most would call a small open meadow. It’s a doe and we haven’t the plan to take a doe on opening day as we would wait for several hunts to fill a doe tag. The rest of the morning was uneventful from the blind so I left to meet dad. The walk down the fire lane was probably 200 yards back to the road where I began in the morning. Inexperienced I walked as if I were heading to the store not expecting to see a deer. Much less a buck. That’s right. As I began walking the dirt road towards dad I saw something strange in the road walking towards me. I ducked for cover on the side of the road when I realized it was a deer. I raised the gun and there he was framed perfectly in the scope, now looking right back at me, a nice 4 point buck. He moved to the side and this left only it’s head visible above some thick brush. I cracked off a shot and he went down. I couldn’t believe it. I held my ground and waited for several minutes never seeing another movement in the deer’s direction. As I walked up the road slowly I saw dad approaching in the vehicle but no deer dead on the side of the road where he had been standing. Again. I couldn’t believe it and after dad surveyed the scene he surmised the buck had slipped in the snow when I shot and the brush that hid the buck’s body earlier now hid the entire deer as he ran off over the ridge. Unharmed. I played that scene out in my head all day thinking what I would do differently if I had the chance again. It was hard to let go of the failure but the next morning would certainly create a better memory. Again sitting well before daybreak in my little brush blind I watched and listened intently even in the blackness. My eyes strained to pull some daylight out of the darkness and reveal the deer that were lined up like a parade just waiting for me. It wasn’t 15 minutes into shooting time when I caught a glimpse of something moving amongst the rows of pines. Within seconds it was obvious that this was a deer heading right to the fire lane on the same path that the doe had taken the morning before. It approached and entered the field then took a direct 45 degree turn right in my direction walking straight towards me with it’s head down. It’s a 6 point buck and here I am with practically a head-on shot. The same type of shot that I fouled-up the day before. The difference is this time I have the upper hand and I can see the body of the deer. The buck doesn’t know I’m there and my crosshairs are following it’s chest waiting for him to stop and raise his head just long enough for me to squeeze off a shot. In the next instant my shot rings loud in the morning air and the buck does a complete flip as the bullet enters it’s chest. He crumples to the ground and lays lifeless while my mind quickly replays the animal flipping like an acrobat into a backflip. My heart races faster now and in a rookie moment that went against what I was taught I rush to see my trophy and the execution of my 80 yard shot. The buck jumps to it’s hooves when I am nearly upon him and my instinct, which felt as much like survival as this close range, takes over firing another shot and dropping him for good. It’s over. I’m shaking with excitement and a story that I feel nobody will ever believe. It isn’t but a few minutes before dad comes walking up the trail after hearing my shots and finds me towering over the buck fighting with my emotion to keep from screaming out that I got one. I can see by his stride that he’s both excited and concerned in his approach and I am sure that I have a perma-grin from ear to ear on my face. Through my emotions I catch a second to compose myself briefly and realize the congratulations through a handshake and a pat on the shoulder. I feel quite proud of my accomplishment. I watched as dad gave me a lesson in field dressing a deer and that was it. I was hooked and realize now that even though I’ve since shot many deer that this little 6 pointer was the buck of my dreams and of many hunters. When the chance offers itself be sure to take your kids, or your dad, hunting or at least spend some time together outdoors and create some memories of your own.